It’s almost winter here in Hawaii, and the plovers (kolea) have returned. They seem to find an open bit of grass or beach and stay there, defending their territory. Its as if after all that travel they want to contain their world into definable square footage. Dickinson’s poem is about contentment found in being alone; in simplicity and constraints. Even the plover’s song ( in summer for ED) is seen as a luxury, overwhelming as compared to a winter’s room with a crackly fire. Nowhere to go. In April plovers molt, losing their golden feathers and replacing them with black and white ones. 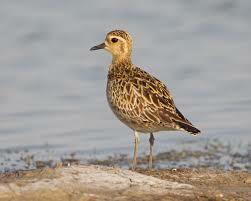 Here in Hawaii, by early May plovers will have lost their golden color and solitary ways. 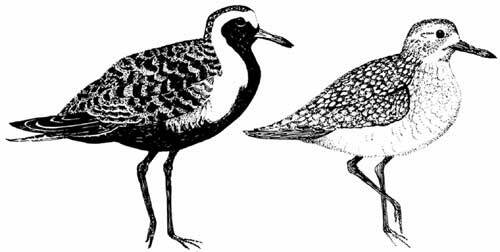 Together, in flocks, will migrate the 2000 miles to Alaska and Siberia. There they nest for another summer season before returning again to Hawaii and other points south and west. Dickinson writes of contentment in solitude and a forced simplicity that the return of winter brings. Here it is a little unsettling, the seemingly continuous summer- it never gets quite that dark, that cold for the crackling fire and a shelf of books. After being here almost four years now, I am beginning to see feel a change in season, just different, and a hint of contentment from the predictability of the return of the migrating animals-plovers, whales. Here is the whole poem. Read it slowly as a antidote to to the frantic holiday season.